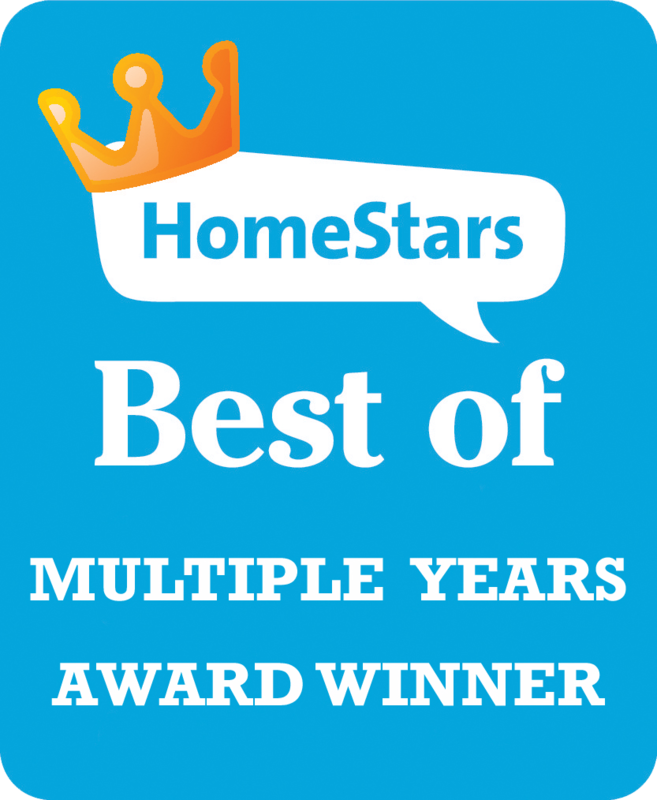 Ideally, your awning's width should be the same as the width of your patio, deck or existing wall. In cases where the patio or deck's width is extremely wide (over 24'), it is recommended either to partially cover the area or to have more than one awning installed to accommodate the entire area. IMPORTANT: The awning's width is the outside dimension of the frame, not the fabric width. The fabric is usually 5 to 6 inches narrower than the frame. Measure the protrusion of your existing patio or deck and select one of the standard awning projections. 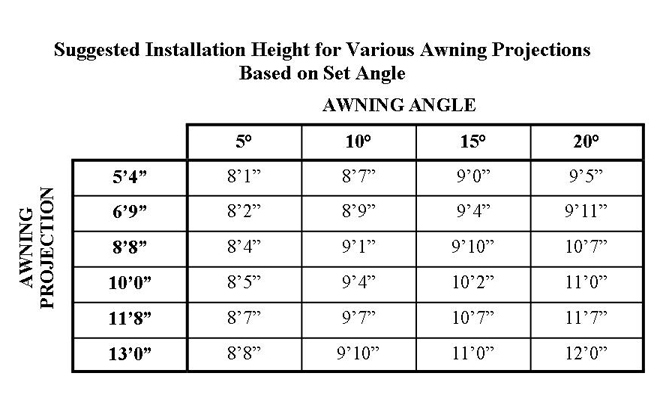 Projections are available in 5'4", 6'9", 8'8", 10'0", 11'8" and 13'0" (projection sizes could vary slightly, depending on the model of awning chosen). PLEASE NOTE: The projection of a retractable awning is the distance from the wall down the fabric slope to the front bar, not the distance from the wall straight out. 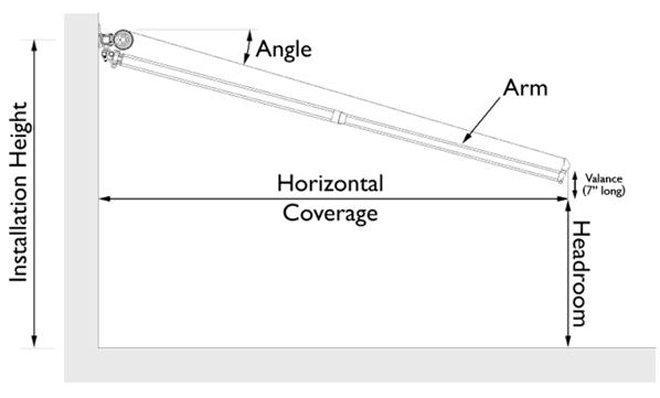 For example: having a 10' projection installed with a 15° inclination will provide approximately 9'8" horizontal coverage on the ground. Therefore, if the horizontal coverage of 10' is critical in your particular application, you might want to consider going with the next available size. 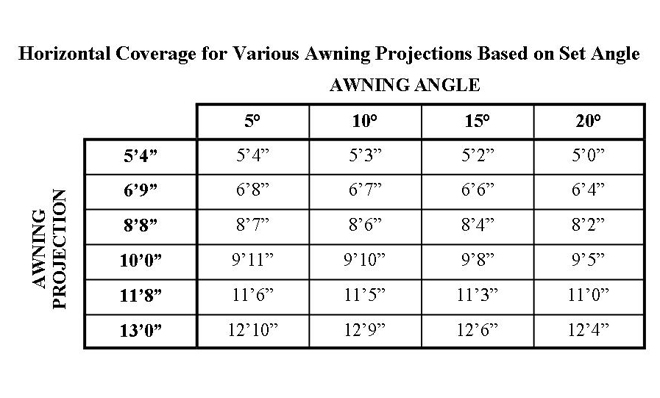 The chart and diagrams above show the horizontal coverage and suggested installation height for various awning projections, as a function of the awning's inclination.